Terre Haute City Hall is located at 17 Harding Avenue, Terre Haute, IN 47807; phone: 812-244-2103. Photo: Paul Dresser Birthplace, ca. 1850, 629 Mulberry Street, Terre Haute, IN. Listed on the National Register of Historic Places in 1973. Photographed by User:Nyttend (own work), 2011, [cc0-by-1.0 (creativecommons.org/publicdomain/zero/1.0/deed.en], via Wikimedia Commons, accessed November, 2014. Terre Haute is the commercial and banking center of a wide Midwestern trade area, situated in a district of farms and coal mines. Seat of Vigo County and industrial, commercial and cultural hub of the fertile Wabash Valley, this alert city covers a 10-square-mile plateau on the east bank of the Wabash River. The principal places of business lie along the main thoroughfare, Wabash Avenue. The population of Terre Haute is predominantly native white. Numerous suburban developments lie north, south and east of the city. In sharp contrast is Taylorsville, near the west end of the Wabash River bridge, now partly eliminated by Paul Dresser Memorial Park. There, on the river bank in shacks built of tin and river debris, the very poor and the outcast live in poverty and squalor. Three institutions of higher learning—Indiana State Teachers College, nearby Rose Polytechnic Institute, and St. Mary-of-the-Woods—offer scholastic opportunities usually to be found only in much larger cities. There is wide support for two little-theater groups, the Terre Haute Symphony Orchestra, art exhibits and frequent platforms of distinguished speakers. 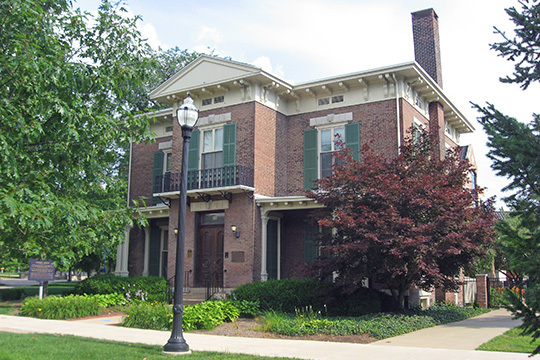 Terre Haute was the home of Eugene V. Debs, labor leader; Claude Bowers, historian and diplomat; Janet Scudder, sculptor; Theodore Dreiser, novelist; Paul Dresser, song writer; Daniel Voorhees, political debater; Lyman Abbott, minister, author and magazine editor; Colonel Richard W. Thompson, Secretary of the Navy under President Hayes; Rose Melville, original 'Sis Hopkins' of the plays Zeb and Sis Hopkins; Gilbert Wilson, mural painter; Anthony ('Skeets') Gallagher, stage and screen comedian; and Max Ehrmann, poet. More than 200 industrial establishments manufacture such diverse products as brick and tile, glass bottles, heating boilers, steel plates and angle iron, paint and varnish, commercial solvents, liquor, canned goods, beer, and corrugated paper and pasteboard shipping containers. The principal industry since 1875 however, has been coal mining, and three-score mining companies have business offices in the city. During a period almost as long as the history of the coal industry, Terre Haute has been regarded as a strong 'union town' and Terre Haute workers have been leaders in labor progress. Great influence was exerted by Eugene V. Debs, who for half a century preached from his home here the economic brotherhood of man; and by the farmer organizations that began with the formation of the first Indiana Grange in 1869 in Honey Creek Township. The site of Terre Haute was known to white men—Jesuit missionaries and French traders—early in the 18th century. Called terre haute (high land) by the French, it once was the home of a band of Wea Indians. Here, according to tradition, the Illinois Indians fought a savage battle with the invading Iroquois, in which the invaders suffered the worst defeat in all their forays into the Midlands. From about 1720 until the end of the French occupation in 1763, the site of Terre Haute was a point on the dividing line between the French colonial provinces of Canada and Louisiana. Americans first settled in the vicinity in 1811, when General William Henry Harrison built Fort Harrison on the Wabash River three miles north of where the city was later built. A small settlement grew up about the fort, but in 1816 a group of southern Indiana and Kentucky businessmen formed the Terre Haute Town Company, bought a tract from the United States Land Office at Vincennes for $30,376.28 and platted Terre Haute. Their surveyor, in recommending the site, said: "If a town is started on this location, it will some day become a flourishing city." In the year following the founding only 2 cabins were built. In 1818, however, the company, by promising to erect public buildings, had Terre Haute designated as the seat of government of the newly organized Vigo County. With prestige thus gained, the river assured the success of the town. Over the river came settlers hoping to earn fortunes in the West, and over it their produce was sent to market. Before the coming of the steamboat, farm products went down the Wabash and Ohio Rivers to New Orleans by flatboat. The first Wabash River steamboat, the Florence, docked in the spring of 1822 at the old flatboat yards south of the foot of Oak Street. Steamboats often could go no farther north because of low water and numerous sandbars; this gave the town a strategic location as a terminal for river shipping. The first industrial activity was the processing of resources of the Wabash Valley. Salted and smoked pork, raw and tanned hides, hominy and whisky were among the first products of Terre Haute factories. In 1832 the thriving village, grown in population to 600, was incorporated as a town. In 1838, completion of the National Road (now US Route 40) from Washington D.C. to Terre Haute, brought stagecoaches and wagon trains with more settlers. The Wabash & Erie Canal reached Terre Haute in 1849, giving the city its most direct and lowest-cost outlet to the Atlantic seaboard. Along the canal within the town new factories and warehouses were established, among them a flour mill, foundry, planing mill, brewery, ice house, candle factory, tannery, and blast furnace. Railroad service to Indianapolis was inaugurated in 1852 by Chauncey Rose and other public-spirited citizens, and to Evansville in 1858. The town was organized as a city in 1853, and the Civil War found Terre Haute a thriving industrial community that was rapidly becoming a railroad center. Coal in this region was first mentioned in 1816 in a letter from David Thomas, a New Yorker, to Eastern friends. Thomas observed that outcroppings of coal at many points along the river and its tributaries in the vicinity of Terre Haute indicated an important industrial future for the settlement. Development of the coal fields did not start, however, until about 1875. In 1838 Jacob Thomas tried unsuccessfully to ship coal from Terre Haute by flatboat. Before he completed loading, the river receded to a low level that left the boat stranded. When the river rose again, the loaded boat sank. As there was little demand for coal at that time because firewood was plentiful and cheap, the venture was not attempted again. With the railroad building boom in the last quarter of the 19th century, however, large-scale coal production became possible. When the coal mines in the vicinity were developed, new factories sprang up also, attracted by low fuel costs. Before the American Federation of Labor was organized, coal miners were members of the Knights of Labor. When in 1890 the United Mine Workers of America was formed, District 11 headquarters made the city, already the home of the Indiana Coal Operators' Association, arbiter of coal-mining relations in Indiana. The governor ordered 2,000 National Guardsmen into the city. Martial law was declared, picketing was forbidden, and on July 23 troops tear-gassed 1,800 pickets. In spite of Statewide liberal protest, martial law was not lifted until February, 1936, although the general strike was called off July 24, 1935. The dispute was placed in the hands of Federal mediators and later the demands of the strikers were sustained by the National Labor Relations Board. A number of employees were discharged for participating in the strike and the National Labor Relations Board ordered the company to rehire them. The company appealed to the United States Supreme Court, which held that the finding of the National Labor Relations Board that the company refused to negotiate with a union was without support, and ordered the decision of the Board to be set aside.